Medulloblastomas, embryonal tumors arising in the cerebellum, commonly contain mutations that activate Wnt signaling. To determine whether increased Wnt signaling in the adult CNS is sufficient to induce tumor formation, we created transgenic mice expressing either wild-type or activated β-catenin in the brain. Wild-type and mutant human β-catenin transgenes were expressed under the control of a murine PrP promoter fragment that drives high level postnatal expression in the CNS. Mutant β-catenin was stabilized by a serine to phenylalanine alteration in codon 37. Expression of the mutant transgene resulted in an approximately two-fold increase in β-catenin protein levels in the cortex and cerebellum of adult animals. Immunohistochemical analysis revealed nuclear β-catenin in hippocampal, cortical and cerebellar neurons of transgenic animals but not in non-transgenic controls. Tail kinking was observed in some transgenic animals, but no CNS malformations or tumors were detected. No tumors or morphologic alterations were detected in the brains of transgenic mice expressing stabilized β-catenin, suggesting that postnatal Wnt signaling in differentiated neurons may not be sufficient to induce CNS tumorigenesis. Medulloblastomas, embryonal neoplasms arising in the cerebellum, are the most common malignant pediatric brain tumor. In man, three inherited syndromes associated with medulloblastomas have been described: Turcot's, Gorlin's and Li Fraumeni (reviewed in ). Li Fraumeni syndrome is caused by inherited mutations in the p53 tumor suppressor gene. Affected individuals develop a large spectrum of CNS and extra-CNS neoplasms, including medulloblastomas . Interestingly, alterations in p53 are relatively rare in sporadic medulloblastomas, with mutations detected in 5% or less of cases [3, 4]. The genes most commonly altered in medulloblastoma are members of developmental signaling pathways. Gorlin's syndrome results from inherited mutations in the Hedgehog receptor PTCH that constitutively activate the pathway. Mutations in the Hedgehog pathway members PTCH, PTCH 2, SUFU and Smo, have all been identified in sporadic medulloblastomas as well, with approximately 25% of cases containing mutations affecting these genes [5–9]. A murine medulloblastoma model was recently developed by disruption of the PTCH gene, with medulloblastoma-like tumors arising in 10–15% of heterozygotes by 9 months of age [10, 11]. Breeding PTCH mice to p53 knockout animals markedly increased tumor incidence. Mice heterozygous for PTCH and lacking p53 all developed medulloblastomas by 3 months of age . Turcot's syndrome is caused by germline mutations in the gene APC, a member of the Wnt signaling pathway. This developmentally important pathway contains several proteins, including APC, Frizzled, Axin and GSK3, which act in concert to promote the proteosomal degradation of β-catenin [13, 14]. When APC is rendered inactive by mutation, β-catenin levels rise and the protein moves into the nucleus where it acts with Tcf/Lef cofactors to regulate transcription of c-myc, cyclin D and other oncogenes . APC mutations have been identified in medulloblastoma cell lines and up to 4% of sporadic medulloblastomas [16, 17]. Furthermore, point mutations or small deletions in β-catenin exon 3 have been identified in 5–10% of sporadic medulloblastomas and in supratentorial primitive neuroectodermal tumors (PNETs) [17–19]. Finally, large deletions in AXIN were recently found in 12% of sporadic medulloblastomas . In the absence of Wnt signaling β-catenin is sequestered in the cytoplasm, and nuclear translocation of β-catenin has been used to monitor activation of the Wnt pathway in a number of different tumor types. We have previously shown that nuclear β-catenin is present in 18% of sporadic medulloblastomas . The greatly increased incidence of medulloblastomas in patients inheriting mutations in the APC tumor suppressor gene suggests that activation of Wnt signaling could be sufficient in some cases to initiate medulloblastoma formation. The mitogenic role played by Wnts in normal CNS development also supports the concept that the pathway could promote growth in the brain [21, 22]. In order to test this hypothesis we created transgenic mice in which the Wnt pathway was aberrantly activated in the CNS. In order to avoid possible in utero lethality caused by excess pathway activity, we used the murine PrP promoter element to construct our transgenic lines. Wnt signaling is known to play a critical role in the development of the brain, and the midbrain and cerebellum do not form in animals lacking Wnt-1 . Furthermore, targeted disruption of the frizzled-4 gene results in cerebellar abnormalities in mice . Transgene expression from the PrP promoter is extremely low during embryonic development, with high-level postnatal expression largely restricted to neurons and glia of the CNS . Transgenic mice expressing either wild-type or mutant β-catenin were generated so that a range of pathway activation could be examined. Mutant β-catenin was stabilized by a serine to phenylalanine alteration in codon 37, a change found in human tumors. We hypothesized that increased expression of wild-type protein might result in modest activation of the pathway, while expression of mutant, stabilized protein would increase Wnt signaling activity more significantly. The mutant β-catenin accumulated in neuronal nuclei in our transgenic mice, but no tumors or other microscopic abnormalities were detected. The lack of aberrant neuronal proliferation in our mice suggests that differentiated neurons may not be as susceptible to the mitogenic effects of Wnt signaling as are neuroepithelial progenitor cells . Medulloblastoma DAOY cells were obtained from the American Type Culture Collection and maintained in Improved MEM Zn++ Option (Richter's Modification) medium containing supplemented with 20% fetal bovine serum (Life Technologies, Inc., USA). The TOPFLASH Wnt reporter plasmid was obtained from Dr. Kenneth Kinzler. FLAG epitope tagged wild-type and S37F mutant β-catenin in pCINeo expression vectors were the kind gifts of Dr. Patrice Morin . Cells were plated at a density of 300,000 per 60 mm plate. Transient transfections of β-catenin, β-galactosidase and Wnt reporter plasmids were performed using the Fugene reagent 24 hours after initial plating (Roche Molecular Biochemicals). Cells were harvested for reporter assays 48 hours after transfection. All experiments were performed in quadruplicate. β-galactosidase and luciferase activities were measured using standard techniques. β-galactosidase activity was used to control for transfection efficiency. Transgene constructs were created using wild-type or S37F mutant β-catenin cDNAs with 3' FLAG epitope sequences. β-catenin cDNAs were inserted into the previously described pBS/MoPrP.Xho vector and the orientation verified by sequencing . The resulting construct was linearized and gel-purified prior to injection into B6/SJL mouse embryos. Transgenic lines were established using standard methods at the Johns Hopkins Transgenic Core Facility. Human β-catenin exon 3 was PCR-amplified from transgenic mouse DNA and sequenced to verify presence or absence of the codon 37 mutations. Mice were maintained on a B6/SJL hybrid background. DNA was extracted from tail clips by proteinase K digestion followed by ethanol precipitation. The transgene was detected by PCR amplification of a 200 bp product using a forward primer located in the β-catenin cDNA sequence (βcat3pb: 5' TCGTTCTTTTCACTCTGGTGGAT 3') and a reverse primer in the PrP promoter (PrP-S: 5' GTGGATACCCCCTCCCCCAGCCTAGACC 3'). A 750 bp control band was produced by amplification from the endogenous PrP gene using PrP-S and the reverse primer (PrP-AS: 5' CCTCTTTGTGACTATGTGGACTGATGTCGG 3'). Homozygous null P53 knockout mice (B6.129S2-Trp53tm1Tyj) were purchased from Jackson Labs and crossed with β-catenin transgenic mice. Transgenic p53 heterozygous mice were then crossed with non-transgenic p53 heterozygotes to produce β-catenin transgenic, p53 null mice. p53 genotyping was done by PCR from tail DNA according to the Jackson Labs Protocol using their oIMR336, oIMR337, oIMR013 and oIMR014 primers. Mouse brains were removed immediately after sacrifice and fixed for 24–48 hours in 10% buffered formalin. Brains were sectioned sagitally or coronally and haematoxylin and eosin stained slides examined by a pathologist (CGE or DLH). Complete necropsies were done on mice that died unexpectedly (DLH). 10% weight/volume protein homogenates were prepared from mouse brain as previously described . Nuclear and cytoplasmic protein fractions were prepared with NE-PER Nuclear and Cytoplasmic Extraction Reagents using the manufacturer's instructions (Pierce Chemical Co., Rockford, IL). HSP90, a cytoplasmic protein, was used to control for loading, and for separation of nuclear and cytoplasmic fractions. Samples were resolved (20 μg per lane total protein, 12.5 μg nuclear and cytoplasmic fractions) by SDS-PAGE. Primary antibody incubations were carried out overnight at 4°C. The transgene product was detected in total protein extracts using a mouse monoclonal anti-FLAG antibody (Sigma-Aldrich, St. Louis, MO) diluted 1:1000 with a mouse monoclonal anti-GAPDH antibody (Research Diagnostics Inc., Flanders, NJ) diluted 1:150,000 as a loading control. Total β-catenin was detected in nuclear and cytoplasmic fractions with a mouse monoclonal anti-β-catenin (E5) antibody (Santa Cruz Biotechnology Inc., Santa Cruz, CA) diluted 1:1000. A rabbit polyclonal anti-hsp90 (H-114) antibody (Santa Cruz) diluted 1:1000 was used as a control. Primary antibodies were detected with peroxidase-conjugated anti-mouse or rabbit IgG secondary antibodies (KPL, Gaithersburg, MD) diluted 1:2000. Western Lightning Chemiluminescence Reagent (Perkin Elmer Life Sciences Inc., Boston, MA) was applied and the signal was visualized with x-ray film. Formalin fixed, paraffin embedded mouse brain sections were deparaffinized and antigen retrieval was performed for 1 minute in a pressure cooker with antigen unmasking solution (Vector Laboratories, Burlingame, CA). Endogenous peroxidase activity was quenched with 3% H2O2 for 5 minutes at room temperature. Sections were incubated for 45 minutes at room temperature with a mouse monoclonal anti-β-catenin (E5) antibody (Santa Cruz) diluted 1:200. The primary antibody was visualized with the Vectastain Elite ABC mouse kit (Vector Labs). In order to evaluate the transcriptional activity of FLAG epitope-tagged β-catenin in a medulloblastoma cell line, the S37F and wild-type constructs were introduced into DAOY cells along with the Wnt pathway TOPFLASH reporter. This reporter plasmid contains three optimal TCF binding sites . TOPFLASH luciferase activity was activated 41-fold by S37F mutant β-catenin and 3.8 fold by wild-type β-catenin in DAOY cells (Fig. 1). S37F mutant β-catenin activity in medulloblastoma DAOY cells. Cotransfection of the TOPLASH Wnt reporter and FLAG-tagged S37F mutant β-catenin into DAOY cells results in 41-fold higher luciferase activity than transfection of TOPFLASH alone. Similar transfections of wild-type β-catenin result in 3.8-fold higher luciferase activity. No luciferase activity was detected in cells transfected with pBluescript (Negative Control). (pTF – TOPFLASH plasmid; WT – wild-type). Five transgenic lines were established, two expressing wild-type human β-catenin (WT-1,2) and three expressing human β-catenin stabilized by mutation of the phosphorylation site at residue 37 (Mut-1,2,3). Levels of transgenic protein were evaluated by Western blot using antibodies directed against a FLAG sequence in the C-terminus of the transgenic protein (Fig. 2A). Transgenic protein was expressed at high levels in the brains of WT-1, Mut-1 and Mut-2 mice and at lower levels in the WT-2 and Mut-3 lines. Protein extracts prepared separately from the cerebral cortex and cerebellum/brainstem had similar protein levels (data not shown). Attempts to localize expression of the transgenic protein immunohistochemically in brain tissue sections using anti-FLAG antibodies were not successful. To evaluate overall expression levels of β-catenin (transgenic and endogenous) Western blots were probed with an antibody that binds both human and murine β-catenin. WT-1 brains contained only modestly increased amounts of protein (data not shown). However, cerebellum from the Mut-1 and Mut-2 lines contained 50–100% more β-catenin protein than non-transgenic controls (Fig. 2B). Some variation in β-catenin protein level was seen between animals, but this was not related to age and high expression levels were seen at all time points evaluated (6 weeks to 12 months; data not shown). β-catenin transgenic protein expression (A) A Western blot of total protein extracts from mouse cerebella probed with anti-FLAG antisera shows high levels of transgenic protein expression in one wild-type human β-catenin line (WT-1) and two stabilized mutant β-catenin lines (Mut-1, Mut-2). Lower expression is detected in the WT-2 wild-type and Mut-3 mutant lines. No expression is seen in the non-transgenic (NT) negative control lane. (B) A Western blot of mouse cerebellar protein divided into cytoplasmic (C) and nuclear (N) fractions and probed with an antibody recognizing endogenous murine as well as transgenic human β-catenin. Extracts from the high-expressing mutant lines Mut-1 and Mut-2 show elevated levels of cytoplasmic and nuclear protein in comparison to non-transgenic siblings. Antibody recognizing the cytoplasmic anti-heat shock protein 90 KDa (HSP90) controls for fractionation and loading. To determine whether expression of transgenic β-catenin resulted in increased Wnt pathway activity we analysed the subcellular distribution of β-catenin in the brain. 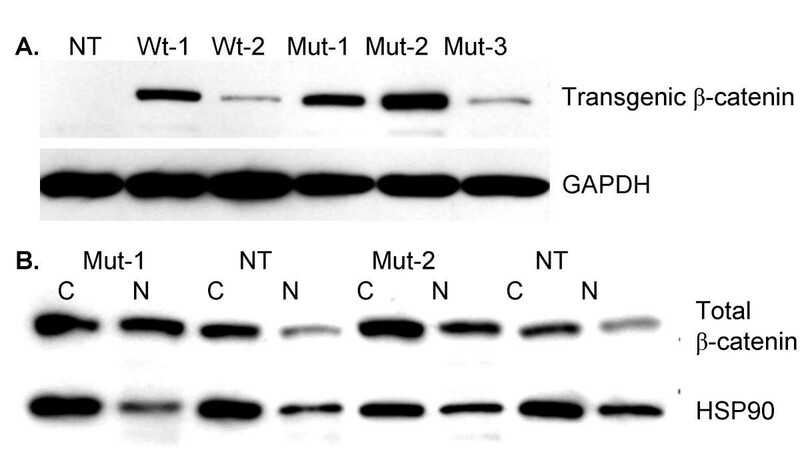 Nuclear translocation of β-catenin is generally associated with Wnt signaling activity. Nuclear fractionation was performed and the amount of total β-catenin in the cytoplasmic and nuclear fractions assayed (Fig. 2B). Stains for the cytoplasmic protein HSP90 were used to evaluate fractionation and revealed some contamination of the nuclear fractions. Still, the amount of β-catenin appeared significantly increased in the nuclear fraction of CNS protein extracts from the Mut-1 transgenic line, and somewhat increased in Mut-2 nuclear fractions. We also analysed β-catenin distribution immunohistochemically. In non-transgenic mice β-catenin is abundant in cytoplasm but excluded from hippocampal, cerebellar or cortical nuclei (Fig. 3A,3C). In contrast, several of the transgenic lines contained numerous neurons with nuclear protein in the hippocampus, cerebral cortex and cerebellum. Consistent with the nuclear fractionation experiments described above, nuclear β-catenin was most prominent in the Mut-1 animals. In the cerebellum 20–40% of the granule cell nuclei were positive, and positive nuclei were also found scattered throughout the molecular layer (Fig. 3B). Purkinje cell nuclei were negative. In the cortex, nuclei of many small to medium sized neurons were strongly positive (Fig. 3D). Nuclear β-catenin was only rarely detected in glial cells, mostly those with oligodendroglial morphology. Strongly positive nuclei were also present in the dentate gyrus and pyramidal cell layer of the hippocampus. 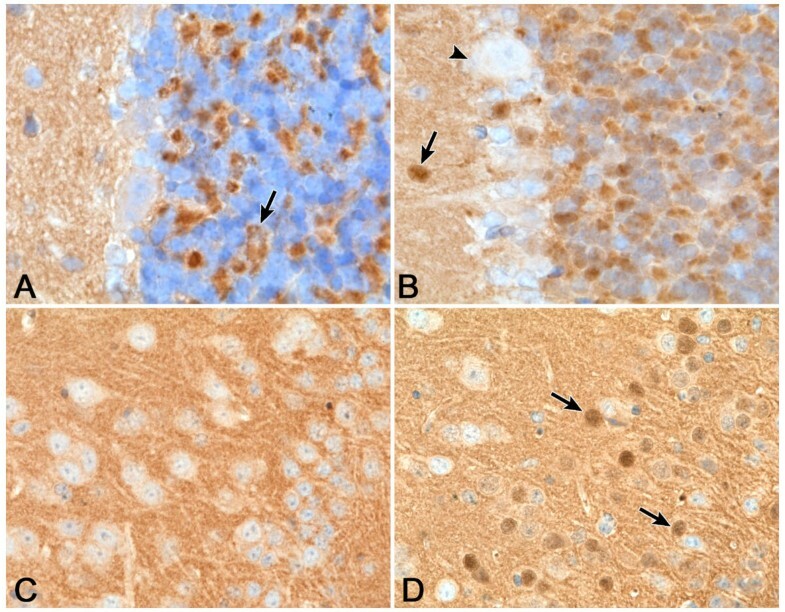 Mut-2 animals contained scattered β-catenin positive nuclei in the hippocampus, cortex and cerebellum, but fewer than were seen in Mut-1. In Mut-3 animals 20–50% of cerebellar neurons in the granule and molecular layers contained nuclear β-catenin, and hippocampal cells were occasionally positive, but the cortical neuronal nuclei were largely negative. The nuclei of hippocampal, cerebellar and cortical neurons in WT-1 and WT-2 mice were also mostly negative for β-catenin, although occasional weakly positive nuclei were seen in these two lines. No nuclear staining was seen in these structures in most non-transgenic animals, suggesting that weak activation of Wnt signaling may occur with overexpression of wild type β-catenin protein. Nuclear β-catenin was detected in the thalami and other cortical deep grey matter loci in both transgenic and non-transgenic animals. Nuclear β-catenin in the cerebellum and cortex of transgenic mice (A) While strong β-catenin immunoreactivity is present in the cellular processes making up the cerebellar glomeruli (arrow), no β-catenin is detected immunohistochemically in the blue hematoxilin-stained nuclei of internal granule layer (IGL) neurons of non-transgenic animals. (B) Many IGL neuronal nuclei contain β-catenin in Mut-1 transgenic animals. Scattered molecular layer neurons also have nuclear β-catenin (arrow), but Purkinje cell nuclei are negative (arrowhead). (C) In non-transgenic animals cerebral cortical neurons and glia do not contain nuclear β-catenin. (D) Many small to medium sized cortical neuronal nuclei are immunopositive for β-catenin (arrows). Original magnification for all images 600X. In order to determine if Wnt signaling was aberrantly active in the cerebellar neuroblasts thought to give rise to some medulloblastomas, β-catenin immunostains were performed on newborn Mut-1 and Mut-2 animals. Nuclei in the proliferating external granule cell layer of P0 transgenics did not contain β-catenin. Nuclear β-catenin was also absent from the ventricular zone cells in P0 transgenic animals. The most striking phenotype was the "kinking" of tails seen in lines Mut-1 and Mut-3 (Table 1). A large percentage of the Mut-3 animals had kinked tails, while in the Mut-1 line it was a rare finding. It is not clear why the Mut-3 line, which has lower levels of transgenic protein in the cortex, was most susceptible to tail defects. Tail kinks ranged from single, acute bends to multiple angulations resembling knots (Fig. 4). Kinked tails were of normal length or slightly shortened. Radiographic analysis revealed vertebral bodies in the kinked regions to be attenuated in size or malformed. Peculiar circling or "waltzing" behaviors were also noted in many of the transgenic animals. These animals spun in place or ran repetitively in tight circles for up to 20 seconds at a time. While the waltzing was most common in mice expressing mutant β-catenin, one non-transgenic mouse also exhibited a loose circling behavior. Phenotypic Analysis of β-catenin Transgenic Mice. Mice from each transgenic line as well as non-transgenic siblings were observed daily to identify any animals with signs of tumors or other neurological abnormalities. However, uncoordinated movements, somnolence, or poor grooming, as is seen in PTCH animals developing tumors, were never observed. A total of 69 mutant β-catenin and 35 wild-type β-catenin animals were observed for at least nine months before being sacrificed (Table 1). Of these, 41 Mut-1 and Mut-2 animals expressing high levels of mutant, stabilized β-catenin were observed for over one year, with 12 animals reaching 15 to 17 months of age. Animals were sacrificed at the end of the observation period and their brains removed, but no tumors or other gross or microscopic CNS abnormalities were detected. While a number of transgenic animals died in the first nine months, the percentage of animals surviving was not significantly different between the transgenic and non-transgenic groups (Table 1). Necropsies on animals expiring prior to sacrifice failed to reveal brain tumors or other CNS alterations. Several of these animals had glomerulonephritis, but overall the causes of death were variable, and, except for tail kinking, no clear pattern of extra-CNS defects emerged in the transgenic animals. To increase the probability of brain tumor development, several transgenic lines (WT-1 and Mut-1,2,3) were crossed onto a p53-deficient background. No brain tumors were identified among the 1 WT-1, 1 Mut-1, 10 Mut-2 and 2 Mut-3 animals that were p53 null. These animals all died within 9 months from lymphomas or other extra-CNS neoplasms known to be associated with abrogation of p53 function. Brain tumors were also absent in the 10 WT-1, 16 Mut-1, 38 Mut-2 and 8 Mut-3 animals that were mice heterozygous at the p53 locus. All of the Mut-1 and Mut-2 mice heterozygous for p53 were observed for at least 9 months, and 17 were observed for 13 to 14 months. We have created transgenic mice expressing either wild-type or mutant human β-catenin in differentiated neurons and glia of the CNS. The mutant gene encodes β-catenin protein stabilized by alteration of a phosphorylation site required for proteosomal degradation. 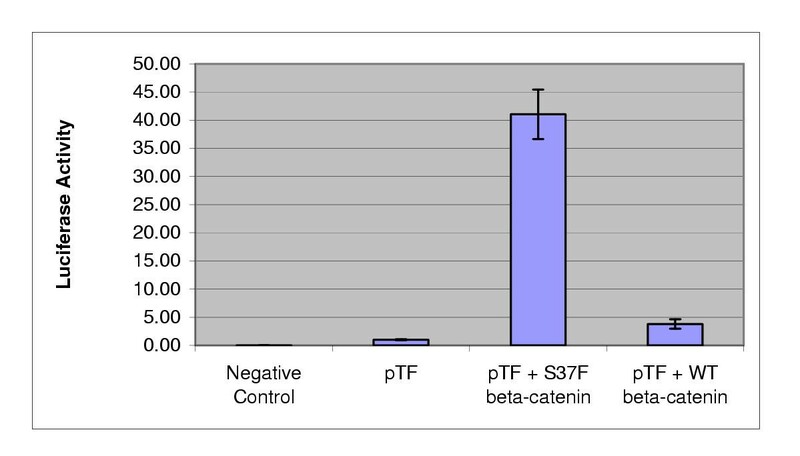 In the transgenic line expressing high levels of human wild-type β-catenin, significant amounts of FLAG epitope-tagged protein were detected, however overall β-catenin levels were only slightly increased, suggesting the mechanisms that normally regulate β-catenin level were able to compensate for the addition of the human transgenic protein. In contrast, expression of S37F mutant β-catenin resulted in a 50–100% increase in overall CNS β-catenin protein levels. Expression of the transgene seemed to be higher in selected neuronal populations. β-catenin nuclear translocation was detected in a subset of hippocampal, cortical and cerebellar neurons normally lacking nuclear protein, consistent with activation of the canonical Wnt pathway in these cells. Two lines of evidence suggest that the stabilized β-catenin protein in our mice is biologically active and promotes Wnt signaling. First, co-transfection of the cDNA used to make our transgenic mice and the TOPFLASH Wnt pathway reporter plasmid into DAOY medulloblastoma cells resulted in over forty-fold induction of reporter activity. Similar results were reported for this FLAG epitope-tagged mutant in other cell lines . Second, the tail kinking and "waltzing" phenotypes in our transgenic animals expressing stabilized human β-catenin are highly similar to those seen in Fused mice . Fused encodes the murine Axin homologue, and mutation of this gene results in activation of Wnt signaling . The tail kinking in our animals presumably results from low level expression of the mutant transgene in utero during vertebral patterning. The circling behavior could be due either to ongoing aberrant Wnt activity in the adult brain, or to subtle developmental defects that are not easily detectable microscopically. We observed the tail and behavioral phenotypes in multiple transgenic lines, suggesting they are not caused by disruption of an endogenous gene by transgene integration. Our Western blot analysis showed that transgenic protein was expressed in the cortex and cerebellum from the earliest time point assayed, six weeks post-gestation, through 12 months of age. As has been previously reported, in non-transgenic animals we detected nuclear β-catenin only in the thalamus and other deep grey matter structures . In transgenic lines expressing mutant, stabilized protein, immunohistochemical analysis revealed nuclear β-catenin in both internal granule layer (IGL) and molecular layer neurons of the cerebellum. Cortical neurons and hippocampal granule and pyramidal cells also contained nuclear β-catenin in transgenic but not non-transgenic animals. We also examined the subcellular localization of mutant β-catenin in newborn transgenic mice. In these P0 animals we failed to identify nuclear β-catenin in the proliferative cells of the cerebellar external granule cell layer or in periventricular neuroblasts. Thus in our transgenic animals, aberrant Wnt activation appears to be limited to mature, postmitotic neurons. Wnt activation in the adult hippocampus, cortex and cerebellum did not result in tumors or other CNS malformations. Strain effects are unlikely to have played a role in this lack of a neoplastic phenotype, as mice with the same background as the one we used have previously been shown to develop medulloblastomas . We further attempted to induce CNS tumors by abrogating p53 function in conjunction with transgenic β-catenin expression. The rational for this approach was the markedly increased incidence of medulloblastomas seen in PTCH heterozygotes deficient for p53, and the enhanced intestinal adenoma phenotype of p53 null, APC heterozygous Min mice [12, 32]. We did not observe any significant phenotypic changes in the CNS of β-catenin transgenic animals heterozygous or homozygous for disruption of the p53 locus. However, most of the β-catenin transgenic mice heterozygous for p53 were followed for only 9 months, and it is possible that some of these mice could develop tumors at a later age. In transgenic mice expressing mutant β-catenin in the breast or colon, protein levels similar to those we describe are sufficient to promote abnormal differentiation and tumors. Harada and colleagues documented intestinal polyposis in β-catenin transgenic mice with a less than 2-fold increase in β-catenin protein level in the polyps . The authors point out that because the transgene was only expressed in a fraction of cells in this tissue, protein levels are likely higher in some epithelial cells. A similar explanation can be applied to our mice, in which nuclear translocation of β-catenin was only detected in a fraction of neurons. A 2-fold to 3-fold increase of β-catenin level in the mammary glands of transgenic mice also results in aberrant differentiation and tumors [34, 35]. Thus while it is possible that a greater than 2-fold increase in β-catenin level would have a neoplastic effect on adult neurons, evidence from other transgenic models suggests the increased protein level in our mice could be sufficient for tumor promotion. Overall, our data suggest that activation of Wnt signaling in adult cerebellar and cortical neurons may not be sufficient for formation of medulloblastoma/PNET. Recent experiments by Fults and colleagues support the idea that stabilized β-catenin expression in the postnatal CNS is not sufficient to initiate tumor formation . Using the RCAS-TVA system they showed that overexpression of c-myc, but not of activated β-catenin, promoted the proliferation of neural progenitor cells in vivo and in vitro. In their in vivo experiments expression was initiated in nestin positive cells postnatally via injection of β-catenin stabilized by a point mutation in codon 37. Activation of the Wnt pathway in primitive neuroepithelial cells in utero results in a quite different outcome. Chenn and Walsh recently created transgenic mice in which β-catenin stabilized by an amino-terminal truncation was expressed in subventricular zone precursor cells in utero under control of the nestin promoter . Brains from these transgenic embryos contained increased numbers of periventricular neuroepithelial cells because a greater number of the precursors re-entered the cell cycle after mitosis. The cerebellar phenotype in these mice was not reported, and it is not clear if the aberrantly proliferating neuroepithelial precursors in their mice represent a pre-neoplastic population. These transgenic lines express β-catenin lacking the entire amino-terminal inhibitory domain, and this truncating β-catenin mutation they may have an increased or changed activity compared to our construct. Alternatively, the contrast between the in utero cortical changes reported by Chenn and Walsh and the lack of a CNS phenotype in our mice or those of Fults could indicate that the developmental stage of the neuroepithelial cells in which stabilized β-catenin is expressed is critical. In summary, we have expressed wild-type and mutant, stabilized human β-catenin in differentiated neurons and glia of adult transgenic mice. While expression of wild-type human protein does not significantly alter overall β-catenin levels, stabilized protein accumulates in hippocampal, cortical and cerebellar neurons and translocates into their nuclei. 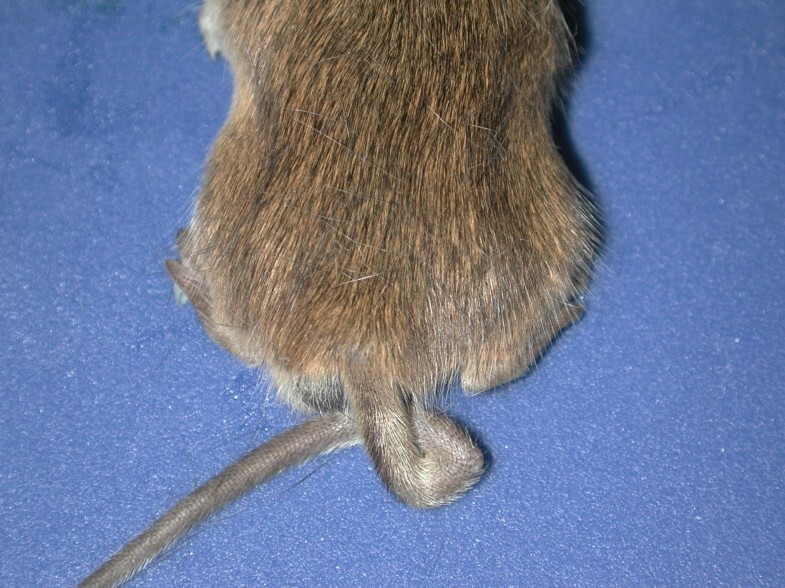 The tail kinking in these mice is highly similar to the phenotype seen in Axin mutants with activated Wnt signaling, indicating the β-catenin protein expressed in our transgenic mice is functional. However, no tumors, pre-neoplastic changes or other CNS morphologic alterations were detected, suggesting that postnatal aberrant Wnt activation is not sufficient to induce CNS tumorigenesis in mice. It is possible, however, that higher β-catenin protein levels, or expression in undifferentiated precursor cells in utero, would result in tumor formation. This research was supported by grants from The Brain Tumor Society and the Childhood Brain Tumor Foundation to CGE, and NIH RR00171 to DLH. Charles Eberhart is the recipient of a Burroughs Wellcome Fund Career Award in the Biomedical Sciences. β-catenin cDNAs were kindly provided by Dr. Patrice Morin. The TOPFLASH Wnt reporter was obtained from Dr. Kenneth Kinzler. JEK, DS, HHS and CGE carried out molecular genetic and immunohistochemical studies. JEK, DLH and CGE cared for and necropsied animals. DLP, DRB and CGE conceived of the study, and participated in its design and coordination. All authors read and approved the final manuscript.